You have been using HTC phone for a long time but recently you have just purchased a brand new Sony Xperia Z5 with improved specs. 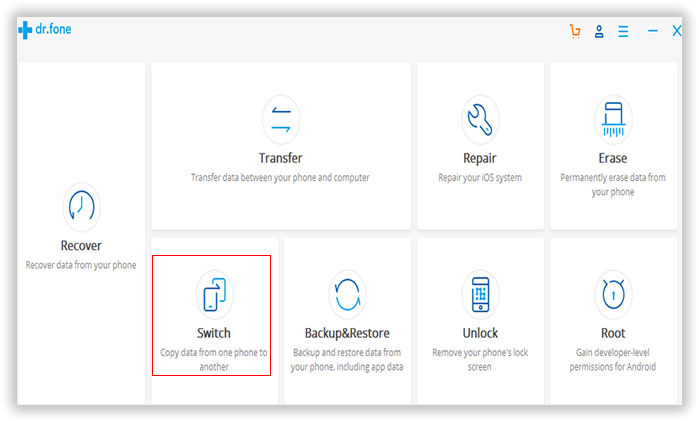 There are certain important data such as contacts/sms/photos on the old phone and you definitely want to copy them to the new phone. You might be wondering is there any comfortable way to transfer contacts from HTC to Sony without manual input? Actually there is a very good solution out there that allows you to transfer contacts and other data from old phone to a new one. The software is called Phone Transfer that can move data directly between different phones in a few minutes. HTC Phone: One M10/M9/M8/M7/A9/E8/Remix, Desire 626, Desire EYE and others. Sony Phone : Xperia X Performance/XA/XP/XZ, Xperia Z5/C4/M4/Z3/Z3 Compact and other more. Data Type: Text Messages, Contacts, Photos, Music, Apps, Video and Documents. First you need to download the software from this site and install it on your computer later. The good news is that this program works on Windows PC and Mac computer. Please make sure download the right installation file. Connect the two Android phones to the same computer via USB cable. And check whether the device name is shown in File Explorer, which indicates whether the phone is recognized by the computer or not. Now open Phone Transfer from the start menu or desktop shortcut. From the main window, you can see there are four options listed in there. Please select Switch in this time. You can see the device name from the program. Make sure the position is right. If it was wrong, click "Flip" button to switch positions. 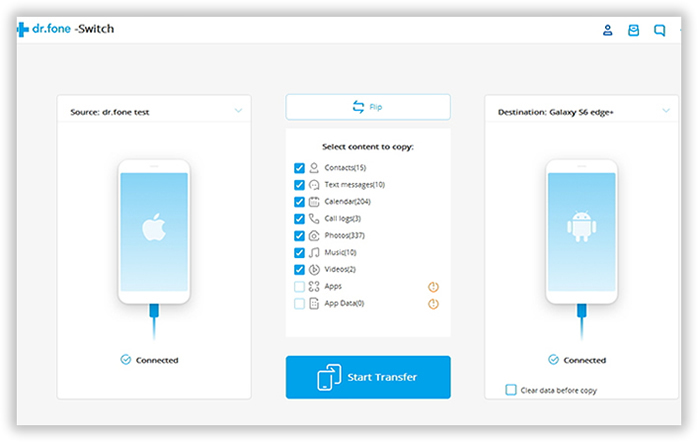 For Android to Android transfer, the program supports all the content transfer, such as contacts, apps, sms. You need to select the content that you would like to transfer. If you want to wipe the destination phone before transfer, then you need to click Clear data before copy. Remember one thing that this software only allows transferring apps between Android phones. You can use this program to move apps from Android to other mobile devices like iOS or Windows Phone. When the content selection is done, now you go to the final step of this tutorial. 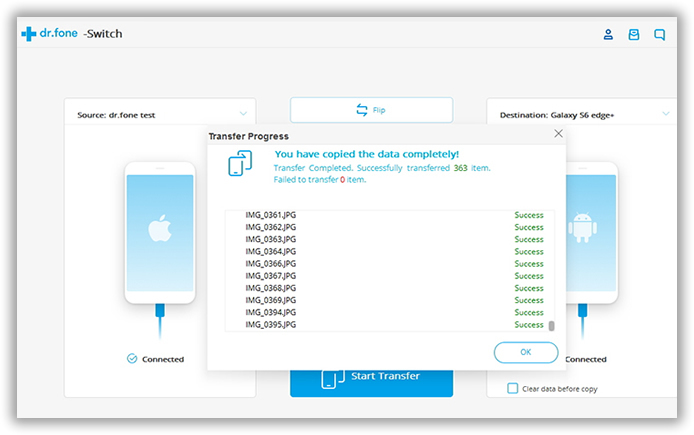 Click "Start Copy" button to begin the data transfer process. Please don't disconnect the phone during this step. It will take about 10 minutes to complete the transfer and the time is dependent on how many data you selected for transfer. Now you have probably realized how easy to transfer the data from HTC phone to Sony Xperia phone. You won't have to type the contacts or text messages one by one. With the help of this software, you can have all the content in your new phone within a very short span of time. It also allows you to wipe all the content from your old phone in order to protect your privacy. In addition, there is a data backup and restore feature within this program. So this is far more a phone transfer app. It is an all-round program that everyone should have a copy to ease the digital life.